Eyeballs are one of the most popular candies for Halloween. Whether they are chocolate, filled or gummy. These peanut butter eyeballs are some what creepy. They are not your typical peanut butter eyeball as they are not chocolate. When you sink your teeth into these peanut butter eyeballs you will be surprised as they are crunchy! These are a Halloween candy spin off of the old time peanut butter bars. Layers of crispy peanut butter covered with a white crunchy shell. Those Halloween guest that will be knocking at your door will be a bit surprise when they sink their teeth in to these candy eyeballs and they crunch. The are individually wrapped in a yellow wrapper with an eyeball on them. These are a perfect candy for many as they are vegan friendly, 0 trans fat, cholesterol and gluten free. 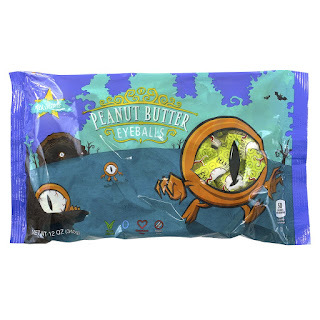 Each bag has 26 peanut butter eyeballs, perfect for handing out for your Halloween candy.